When was the last time you visited a place that had no municipal power or water? It may sound primitive, but it’s the magic of Tulum. 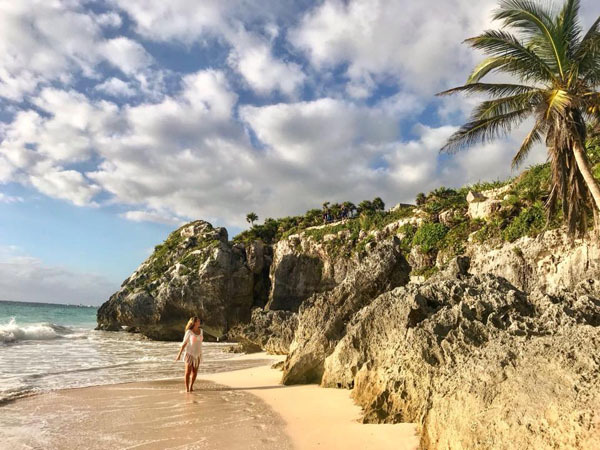 Only an hour and a half from Cancun, Mexico, at the southern tip of Riviera Maya, Tulum is a destination unlike any other in the world. Forget the massive, annoying mega-resorts. This town is all about the chic boutique hotels that dot a 5-mile stretch of silky pristine sands and aquamarine surf. Only one road separates this relaxed boho beach sanctuary from the jungle along the Yucatán Peninsula coast. 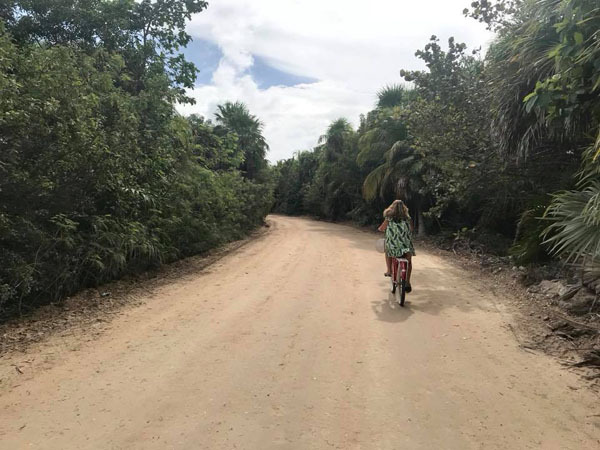 Ten years ago, Tulum was pretty undiscovered, but now with rustic hotels – many with less than twenty rooms – vacation feels like staying in your own private villa. Since all hotels on the strip are powered by generators (and solar), new development maintains a simple essence while embracing eco-modernization. The food scene rivals any major city, but with local healthy ingredients so fresh that there is often no need for refrigeration and many restaurants cook on open wood fired grills. After you have had enough yoga, beach lounging, and shrimp and fish tacos, the adventurous traveler can satiate their curiosity with excursions, like viewing Mayan ruins, kite surfing, star gazing, and swimming, snorkeling, or scuba diving in the ocean or in one of the many cenotes (natural underground limestone sinkholes). Welcome to Tulum, where simplicity and nature are the new luxury. 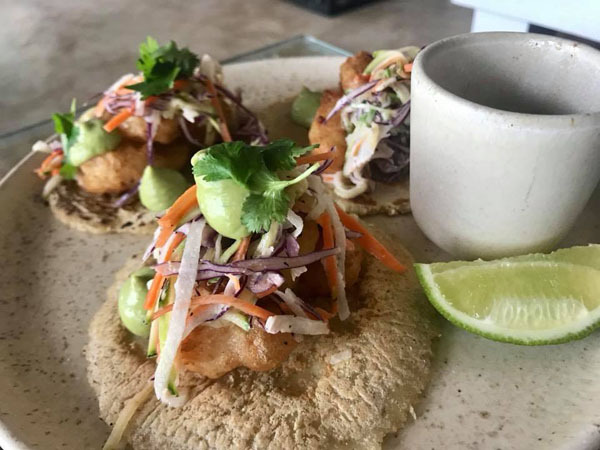 The global cuisine in Tulum blends traditional Mexican fare with fresh caught seafood along with modern approaches thanks to the culinary creatives flocking the area. Get your cheap taco fix at Safari with their 1971 Airstream kitchen serving “campfire food” from a small wood fired pit, or bury your toes in the sand (day or night) at beachfront Taqueria La Eufemia – with two-for-one happy hour drinks and tasty dollar tacos. Head into town to the local divey spot Taqueria Honoria for dirt cheap turkey, vegan, pork, carne asada, or breakfast tacos (and homemade bread) before it closes at 2:00 pm. 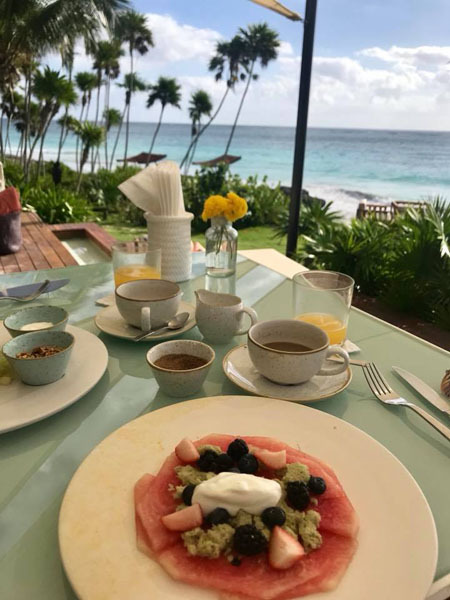 For breakfast (or yoga), don’t miss the The Real Coconut at Sanara Hotel with a dazzling breezy ocean scene offering uber healthy fresh made-to-order juices, tonics, coffee and smoothie concoctions. Everything is gluten, dairy, lactose and process sugar free! Fresco’s at The Beach Tulum also offers a nutritious breakfast selection with Mexican flair. Enjoy a variety of fresh juices, healthy smoothies, avocado toast, gluten-free pancakes, and so much more. For pricier eats, try scene-y amazing options like Arca, Gitano, Casa Banana, Casa Jaguar, and Beso (from Ibiza/Formentera). They’re all within a block of each other at the south end of the hotel zone. Expect locally caught seafood, grilled or prepared as ceviche, plus beef and local vegetables. Everyone talks about Hartwood due to their wood fired cooking bringing grilled simplicity from the land and sea. Score a table by arriving at 5:30 when they are most likely to accept walk-ins. At the north end, make reservations for Kitchen Table (online up to a week in advance), for food so fresh I swear the octopus was still moving. Nearby restaurants at Mi Amor and Mezzanine hotels are excellent alternatives with distinctly different flavor profiles. 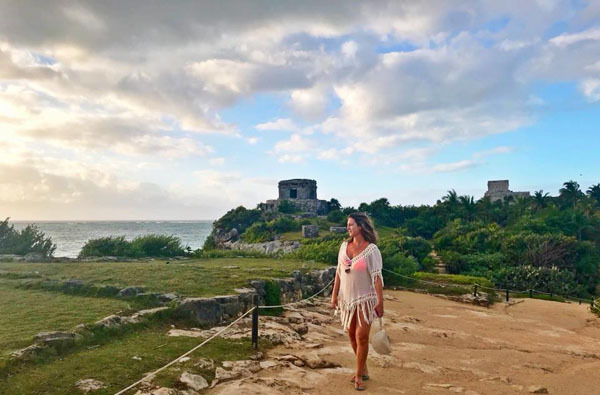 Visit the Mayan Tulum Ruins at sunset, where the walled city atop a cliff becomes awash with the sun glow while iguanas parade around these ancient fortresses along the coast. Go after 5:30 to miss the crowds. It’s 3x the cost ($12 vs $4), but worth it! Explore one of the hundreds of nearby freshwater cenotes (sinkholes). Try spiritual cenote Sac Actun’s underwater cave system, where you can snorkel or scuba through a never-ending network of caverns filled with stalactites, fish, and bats while roots from above break through the limestone – filling the caves with light. Don’t miss climbing Coba, the tallest pyramid in the Mayan world (and the last you can actually climb) that offers a tree-top panoramic horizon view above the jungle for miles. And be sure to experience the biodiversity of Sian Ka’an Biosphere, a 1.3 million acre UNESCO nature preserve. From the archaeological site of Muyil, float down a crystal clear canal dug by the Mayans. Walk around the nearby downtown (pueblo), not far from the main beach strip, for affordable local eats and cheaper souvenirs. You can often find the same goods as the hotel zone, but half the price. The party set will want to dance the night away at Papaya Playa, where DJ’s come from around the world to shake things up, or frequent the new Boa Tulum Beach Club for a day bash situated in a stunning beach cove filled with lounge chairs and pumping tunes. For a more relaxed vibe, sign up for sunset music sessions at Habitas on Facebook. 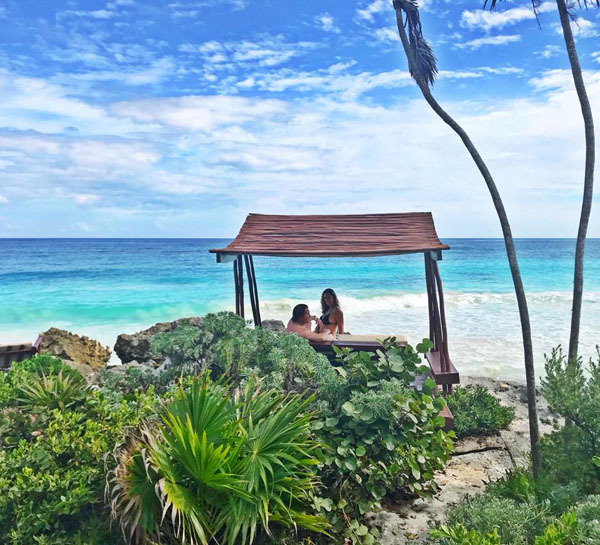 Unplug at Hotel Cabanas Tulum nestled on the silky sand with beachfront or jungle views. Our room not only had a balcony to feel the warm breezes, but a private rooftop Jacuzzi to soak and gaze at the ocean. Designed in stylish beach-y minimalist décor, we adored this spot for the location and amenities. Spend your days lying on one of their many oceanfront beds soaking up the sun with a cocktail in hand or walk/bike to one of the many hip stores, restaurants, and bars. 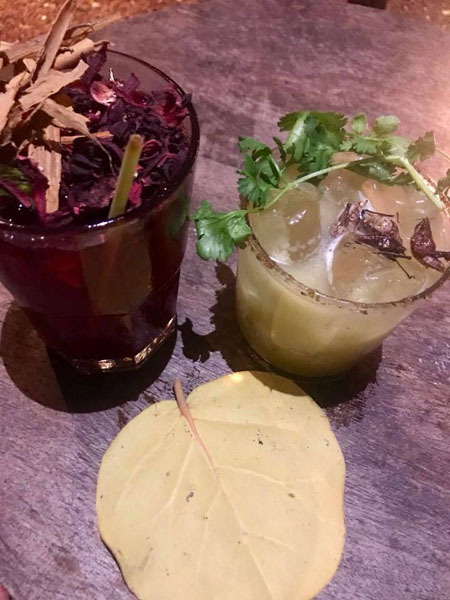 Turn the romance up at adults-only mod Mi Amor. Zen waterways and a long reflecting pool invite you in. Rooms are airy and open with floor to ceiling sliding doors – many featuring private outdoor hot tubs. 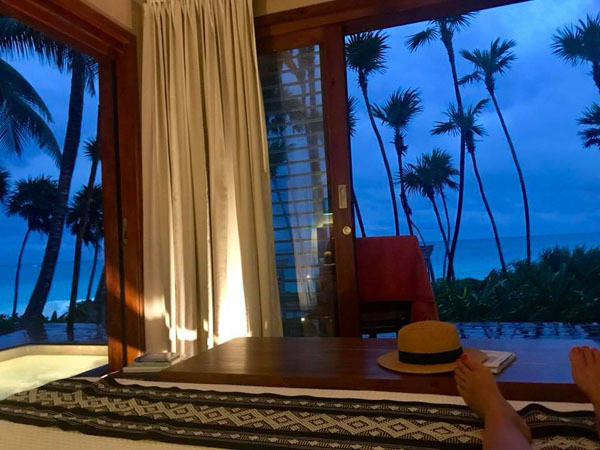 The service is among the best we have experienced and the private oceanfront ‘cabanas’ are unlike anything we could have imagined, as our room was backed up to the jungle situated on a blustery cliff. Enjoy cocktails under the stars with the crashing waves, and sample new flavor combinations from their French-Italian flair menu. 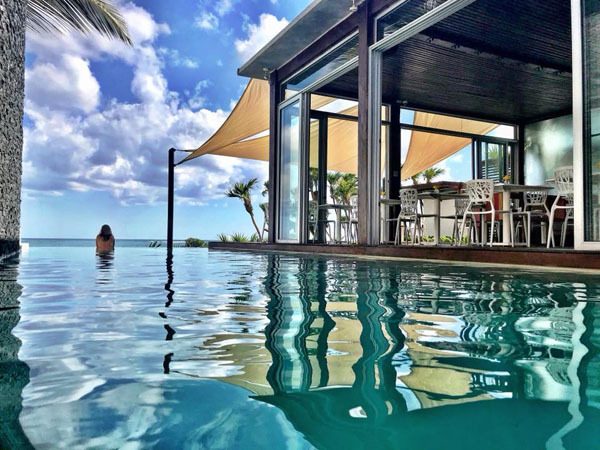 Escape from it all at El Pez, a boutique hotel property located on a stunning secluded cove where birds dive bomb, fisherman get their catch of the day, and the nonstop pounding surf is mesmerizing. We loved this spot so much we came back less than a year later to stay in one of their beach houses. With less than 20 beachfront rooms, El Pez feels like your own villa. Stay here to relish in the simple things in life, like the sunrise streaming in your room, tea waiting for you in your casa each night, and live hypnotic music setting the dinner mood. Their scrumptious complimentary breakfast in the outdoor lounge area by the sea will always be seared in my memory. Tulum is magic. Trust me, you will never want to leave.